What happens to a changing table when the baby grows up? You convert it into a dresser. That’s the idea behind the child changing tables from Brandenberry. These solid wood, custom Amish-made tables are sturdy, durable and long-lasting. Making them a smart investment. 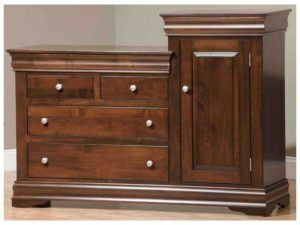 The Carlisle Children’s Changing Table with Tower features a spacious design for a growing family. Dynamic storage space marks the Contempo Children’s Changing Tower. The Louis Phillippe Children’s Changing Table with Tower offers dynamic storage space. Rich wood finish and efficient design unite in the Mission Children’s Changing Table with Tower. 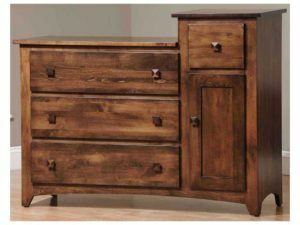 The lineup of child changing tables from Brandenberry Amish Furniture represents a smart approach to furniture shopping. 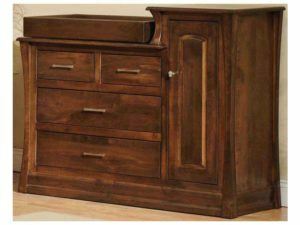 Each wood changing table dresser has all the usual baby-changing features. Like a flat baby changing station plus easy-access drawers and cabinet space. And when the baby outgrows the changing table, the unit easily converts into a hutch – complete with a mirror. So you get two pieces of furniture in one. 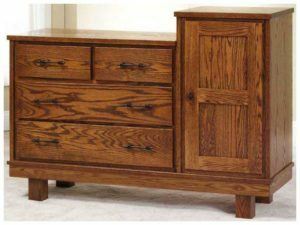 Amish artisans painstakingly handcraft each wood changing table dresser. And they use solid hardwoods. Like oak, maple, cherry and hickory. So the table you choose will be rather sturdy. In fact, it’s so durable, with proper care, you can except it to serve multiple generations of kids. We know that safety is your number one concern as you consider furniture for your children. That’s why we include solid wood backs, sides and drawers. Plus fronts, tops, drawer bottoms, braces and partitions. What’s more, our finishes always meet or exceed ASTM and consumer product standards. So you can enjoy peace of mind that are you are providing a safe and sturdy changing table for your child. You can customize your chosen table to make it just the way you like it. And your choices include wood species, finish, hardware and more.